The Galaxy Tab E is one of the oldest Samsung tablets still available for purchase. Introduced on the market back in 2015, the slate has already received two major Android updates that brought it to Android 7.0 Nougat. 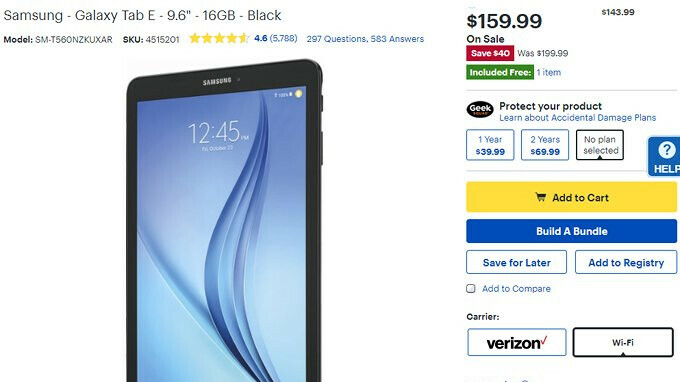 After almost three years on the market, the Galaxy Tab E's price dropped to $200, a pretty decent amount considering we're talking about a Samsung product. However, for just one day, Best Buy offers the tablet for 20% off, which means customers can get it for $160. More importantly, Best Buy offers the 9.6-inch version that packs 16GB internal memory. Also, the deal includes a 6-months Internet Security subscription for free, which will allow you to protect up to 3 devices (Android, Mac, Windows, iOS) against viruses, malware, phishing attacks and other online threats. As far as the Galaxy Tab E goes, Samsung's tablet is a bit obsolete hardware-wise, but that's understandable considering it was launched three years ago. That being said, the slate comes equipped with a 1.2GHz quad-core processor, 1.5GB RAM, and 16GB expandable storage. Last but not least, Samsung Galaxy Tab E sports a 9.6-inch display with 1280 x 800 pixels resolution, a 5-megapixel rear camera, a 2-megapixel selfie camera and a massive 7,300 mAh battery.